10. It was a big jewel week for Queen Maxima of the Netherlands, who wore her golden fan earrings by JAR on Monday in Vlaardingen. 9. Queen Letizia of Spain wore her diamond wedding earrings during a trip to Puerto Rico on Tuesday. 8. During a visit to the London Zoo on Thursday, Queen Elizabeth II of the United Kingdom wore the Greville Scroll Brooch, a diamond, pearl, and platinum piece that was a part of the Greville bequest to the Queen Mother. 7. King Willem-Alexander and Queen Maxima made a state visit to France this week, and for the return dinner, she donned diamonds and rubies, including her long diamond and ruby floral pendant earrings. 6. The Prince of Wales and the Duchess of Cornwall have been on a visit to the Balkans this week. Camilla wore her diamond serpent necklace (layered over her delicate gold necklace with a "C" charm) for a dinner in Zagreb on Monday. ... and that she wore a large brooch from the suite (formerly the central element of the tiara) in her hair. 4. The ladies of the Danish royal family ended up claiming the top spots for the week. Queen Margrethe hosted a gala for artists at Christiansborg Palace on Tuesday. Princess Marie wore Princess Dagmar's Floral Tiara with a diamond and sapphire brooch/pendant that belonged to Queen Alexandrine. 3. Princess Benedikte also attended the gala; she wore her diamond floral birthday tiara with her portion of Queen Alexandrine's sautoir necklace, plus a diamond and sapphire brooch that belonged to her mother, Queen Ingrid. Behind her, as a bonus, you can see her daughter, Princess Nathalie of Sayn-Wittgenstein-Berleburg, wearing a lovely gray pearl necklace. 2. Queen Margrethe glittered at the gala in diamonds, including the Baden Palmette Tiara. 1. Without a doubt, spot #1 this week goes to Crown Princess Mary, who wore her convertible diamond necklace/tiara as a diadem for the first time on Tuesday evening. 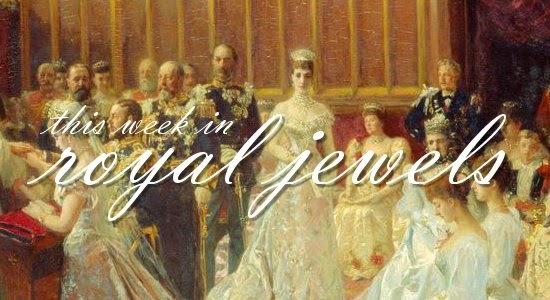 You can read more about the tiara (and see pictures of it worn as a necklace) in our earlier post from this week.